Official away shirt for QPR FC for the 2017/18 season, supplied by Errea. We are an official Errea stockist. New with tags in Errea packaging. Please note that these shirts are in EU sizes - the equivalent UK/US size is one size smaller. - 1882 woven at back of neck. - Red and dark blue hoops. 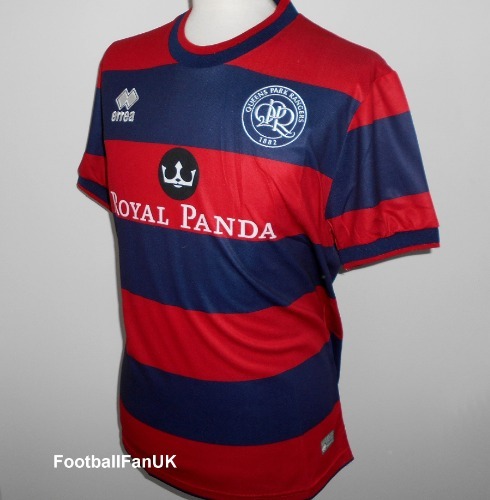 - #weareqpr printed inside neck. - Adult UK/US Medium size (EU-M). Chest 41", length 28". - Adult UK/US Med/Lge size (EU-L). Chest 42", length 29" . - Adult UK/US Large size (EU-XL). Chest 44", length 30". - Adult UK/US XL size (EU-XXL). Chest 47", length 31". - Adult UK/US XXL size (EU-XXXL). Chest 50", length 32".